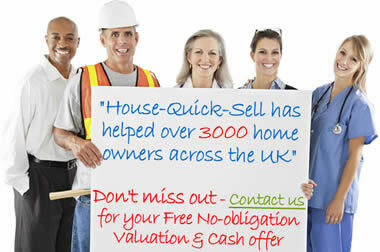 House-Quick-Sell® is the UK's leading national home buyer with over 18 years of experience in buying property. 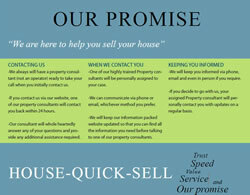 Our flexible service is the fastest way to sell your property. You will recieve an instant, no-obligation, genuine offer you can trust and if you decide to go with us we won't even charge any agent, legal or valuation fees! Sell within 7 days - Exchange in 24 hours! "Unlike other house selling options"
"We are very pleased with the service we've have had, it's just taken about 3 weeks"
"Relieved to have found your site"
"Straight talking, straight dealing, very good, very professional"
How It Works - 3 Steps easy steps! In 7 days if needed. See success story "buy my house"
We take care of everything, keeping the process as hassle free as possible. We stick to our agreement to completion. HQS offers a service that saves thousands in fee's and the advantages above are clear to see! Whatever your circumstances, HQS aims to provide you with a fast, reliable and professional service to ensure that you can sell your property quickly. We will buy "as-seen" in any condition or location - no need to re-decorate your house! We guarantee a cash offer for your home - whether it's a house, flat or apartment. Warning! - Don't miss out on selling! As reported by the BBC and other reputable media sources the house selling market is not expected to recover any time soon. With interest rates planned to go up and the market expected to remain "sluggish" now is the time to take action before further market changes may make it even more difficult to sell your property. We are a truly national company and buy properties anywhere in England, Scotland or Wales. Within these areas, there are no parts we won’t buy in, nothing out of bounds or ‘not in quite the right area’. CHALLENGE US to give you a fair deal! If you’ve been trying to sell your house with no success, you need to at least consider HQS offer as an alternative. You’ve got nothing to lose as you can always continue advertising your house via traditional methods. UK homebuyer: AVOID or a Legitimate option? We buy any home: Is that REALLY true or just a lie? Never again have to ask "Who will buy my house now ?" READ this article if you need to sell house fast? New to the website? Read our House quick sell reviews for an overview of the website and guide on navigating around. Do you have a flat? Maybe it's an usual type of property or location? We buy any flat in the UK so carry on reading to find out if we can help you sell your flat fast.